Trends and times, these two complementary forces move just about everything in design. When they work together, everything flows beautifully – the times change, and the trends change with them. As they do, we begin to love new kinds of furniture, reinterpret old patterns and find new ways to use colors. At the same time, the trends that develop, evolve and move on over a certain number of years define an era, one that influences and shapes all the eras that come after it. It’s a great system – when it works. But sometimes things get out of sync. Sometimes a home can get stuck in an era. We’ve all seen it happen – a kitchen that’s frozen in the 60s; a living room that time forgot. When it happens, it can be a challenge to see past the way things have “always” been and envision the space with a new life in the current era. But when you do it, the results are astounding. With our most recent project, we found ourselves trapped in 1984, right along with the bathroom we were there to redesign. Striped wallpaper, thick green paint and mottled pink floor tile dominated a space that felt cramped and old. It was functional, but reflected the length of the home’s past more than its 21st century present. It was exactly the type of project where it helps to have a good partner. To give this bathroom the modern update it deserved we teamed with LOWE’S, where we found everything we needed to make miracles happen. The end result is a modern bathroom with hardwearing materials that can hold up to an active family of three. We approached the bathroom with the goal to not only update the space but to design something classic. The home had originally been built in 1925, and the bathroom showed the trends of the time including small but beautiful stain glass windows set into the wall around the vanity and a marble slab on the shower wall. In planning our renovation, the first thing we did was to pare down the color palette. There was a time for purple, pink and green (and marble) in the palette of a single room, but 2018 calls for something clean and refined. We opted for a simple palette of black and white, with the thought that it would emphasize the modern lines of the new furnishings we were bringing in and also stand a good chance of retaining its appeal as the eras come and go. Creating the new aesthetic began with the walls and floors. The bathroom walls were stripped down to the wood and built again with Futuro White Porcelain Tile. The tile created a perfect backdrop, its color and texture working well with the original marble surrounding the shower. On the floors we laid Cementina Black and White Ceramic Tile. From first glance, the neutral black and white is anything but boring. The bold, abstract pattern of the floor and the subtle shading of the walls making a statement the moment you walk into the room. This is the home’s only full bathroom, so every element was brought in to work overtime. Every room is defined by its furnishings, and bathrooms, with so many functional needs, rely on their furnishings more than most. To increase the utility of the space for the family, we brought in a larger vanity than was previously there, this one in a dark gray with a natural marble top. The well-composed piece brings a classic furniture detail to the bathroom. The marble top layers beautifully with the original marble in the room, while the dark gray base is a perfect fit with the tile floor. The Roveland Vanity is also equipped with plenty of storage for everything from hairbrushes to toothbrushes, along with all of the rest of a bathroom’s various necessities. To bring a sense of luxury and relaxation into the room, we added a gorgeous new soaking tub. The tub proved to be one of the renovation’s great challenges as the original bathtub had actually been built into the frame of the home, and was not at all eager to be moved. Once it was, however, Wyndham’s Laura White Bathtub was just the modern touch that the room had been needing. For the homeowners, the parents of an adorable three-year-old, the tub is perfect for bath time as well as an ideal way to relax after their little one goes to bed. For their son, the tub is just an oversized pool, and his new favorite toy to play with. After the tub, the shower was the most persistent problem area. Separate from the tub, it was a small, narrow space made smaller by a plastic shell that had been put in along with laminate tile and several jutting alcoves and shelves. The shell, along with the plastic shower head was worn and in sore need of repair. To rehabilitate the tiny shower and add to the luxe style of the space, we extended the porcelain tile of the outer walls into the shower pairing it with White Honeycomb Ceramic Floor Tiles to bring some additional pattern to the shower floor. To contrast with the white backdrop, a shower faucet in oil-rubbed bronze was added to replace the older plastic model. Bathroom design is the perfect marriage of form meets function. Everything has to stand up to water and the daily grooming that happens in this space. But those functional elements can also be beautiful, like the smooth shape of the Jacuzzi Primo White WaterSense Toilet. Not only is the shape modern and organic, but the WaterSense technology helps to save water, which is crucial in an older home. With all of the furnishings and fixtures updated, HGTV Home by Sherwin Williams Infinity Paint in stark white, brought all of the elements in the space together, replacing the visibly worn green paint that had previously covered all of the room’s wooden surfaces. And the new paint shines even brighter under the glow of the new lighting that we added to the space. An Antique Bronze Chandelier was a new addition, bringing extra light into the bathroom. And the older, outdated sconces were replaced with streamlined modern scones in bronze and gold. Any home built almost a century ago is going to have a few rooms that show its age. When we started, this bathroom was stuck in a bygone era with worn furnishings, faded paint and an out-of-step color palette. The finished space is a seamless combination of modern and classic elements held together by a classic black and white color palette for a luxurious powder room with a contemporary look and a meditative, spa-like feel. Time travel isn’t easy, but with help from LOWE’S this remodel has brought this 1980s bathroom into the 21st century, and we’re thrilled that our clients now have a space to relax in, that we know they’ll love for years to come. See more of the before-and-after transformation of this space in the gallery below. This post is sponsored by LOWE’S. Product was provided by LOWE’S and we have been financially compensated for this post. Design and all opinions are our own. 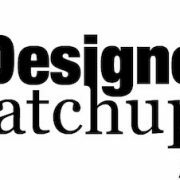 HP Designer Matchup Challenge: Week 3!